Should I Lay Turf in Winter? Whether you have just built a new house, are selling your property, or just want to spruce up your tired looking back yard, new grass has huge appeal and can transform an outdoor space. A lot of people are under the impression that you can’t lay grass during the cooler months, when in fact the opposite is true! Not only is laying grass in winter possible, but it actually has a lot of benefits. Keeping the lawn well hydrated is essential while the new turf is being established. No matter the season, daily watering is important. However, in winter your lawn won’t dry out as quickly and the weather will often work in your favour, saving you time and money on your water bill. During winter it can take the grass longer to become established (approximately four weeks); however, these conditions provide the ideal time to prepare and lay your new grass. As foot traffic, furniture and family pets can all cause damage to your new lawn while it’s being established, it’s beneficial for the turf to be generally left alone. It’s recommended that during the first four to six weeks of your new grass being laid you refrain from mowing so that you don’t disrupt the grass taking root and settling. By having your grass laid and established in winter, it has months to develop and mature its root system before a potentially harsh and hot summer season rolls around. In summer, your lawn will be looking it’s very best and ready for hours or outdoor fun and entertainment (who doesn’t love back yard cricket?!). While laying your lawn yourself is possible, it’s always advisable to seek professional help. Turf and lawn professionals have the knowledge to help you choose the most suitable grass variety for your climate and soil. 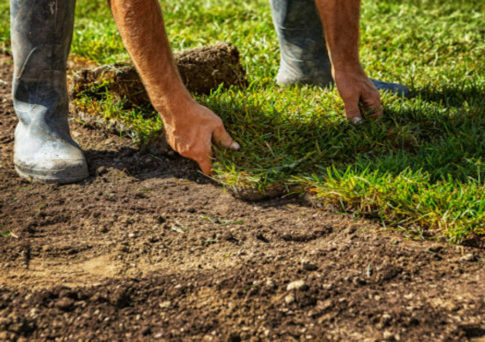 They can look after every aspect of the project from preparing the soil and laying the new grass, to rolling, cleaning up and providing ongoing advice, so that your backyard can look lush and new. All you have to worry about is the BBQ for summer. Need turf? At GoTurf, we make the process easy! Call us today and be confident in the quality and service of your brand new, green lawn.